← Why was the cat domesticated? How can cats be so loving yet vicious? We are obviously referring to domestic cats. You can answer the question in a sentence. Domestic cats can be both loving (a lot) and vicious (rarely) because they are barely domesticated North African wildcats, a top predator and killer, living in an interspecies friendship with humans in a normally loving human environment. However, when the circumstances are right a switch is flicked in their heads and they become a wild cat. They are wild at heart. Ten thousand years of domestication has turned the North African wildcat into a fairly sociable, relatively amiable animal companion to humans but treat him badly and trigger the inner instincts of this top predator and you’ll see the vicious side. It rarely happens in households where the caretaker is knowledgeable and sensible but even then there might be moments. The important point is that we admire the domestic cat for her heritage. It’s amazing to live with a wonderful predator and it’s one of their attractions. It’s great to live with an animal who is friendly and loving towards us and depends on us. We are privileged to have the responsibly of looking after our domestic cats. However, there has to be respect for the domestic cat; respect for her wild side and her 10,000 year ancestry. We must never forget it. 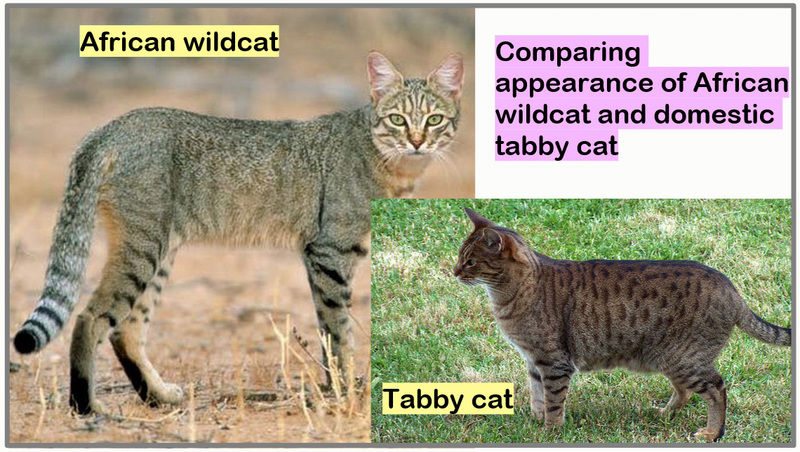 The typical slender tabby cat is very similar in appearance to the North Africa wildcat. And when she is wandering around outside, momentarily distanced and disconnected from her human family she might revert to what is hard wired into her DNA: the wild cat in the desert landscape of North Africa and the Middle East. Give it another 10,000 years of domestication and the question in the title might be redundant. P.S. Unsocialised domestic cats show their wild side almost all the time and will be scared and therefore possibly vicious towards humans. It’s defensive behavior. P.P.S. Humans can also be loving and vicious. In fact humans have a greater propensity for viciousness than cats but in a human way. Funny how we don’t consider songbirds to be vicious as they batter snails to eat them, haul worms from the ground, rip them to pieces alive, or trash the nests of other birds, destroying the young within. Not to mention what raptors get up to. Yet if a cat is seen following the same instincts of predation, humans label it vicious and hatred of the cat increases. Most humans now have such little clue or experience of true nature, which is bloody and raw, that resort to hysterical language and action to castigate cats to the hilt. I believe this unfair, unintelligent labelling is applied to all domesticated species. It just depends on personal preference as to which species a person ends up hating. To me, nothing is more rewarding than sharing my life with the most wonderful domestic cat. They are not vicious or cruel, we humans are just arrogant, cowardly and dense. We prefer this state of affairs, it brings us the illusion of power & superiority. Humans thrive on the abuse of environments and the life they contain. More humans are killed and maimed by the domestic dog than cats Micheal. I consider many dogs to be vicious by either nature or nurture and often cause horrible disfiguring injuries to family, children and though aggression when allowed to run at large. I do not consider my cats nature to be vicious. They are what they are and evolved as nature intended. I consider cats to be highly evolved , intelligent and empathetic pets who are capable of forming a strong bond based on mutual respect rather than bred in servitude. Cats are not vicious or cold blooded killers that is giving their actions human motivation. They are in my opinion the perfect companion animal. I agree. The question is valid. And I think I have answered the question. I am not saying the cat is vicious. I am saying that if the domestic cat is ill-treated or in defensive mode she or he can be vicious. That must be the case because cats are predators. They bite and scratch when needs must. They have weapons. Yes, dogs hurt humans far more often but dogs were not on the agenda in this discussion.